I am Locutus of Borg. May I take your order? 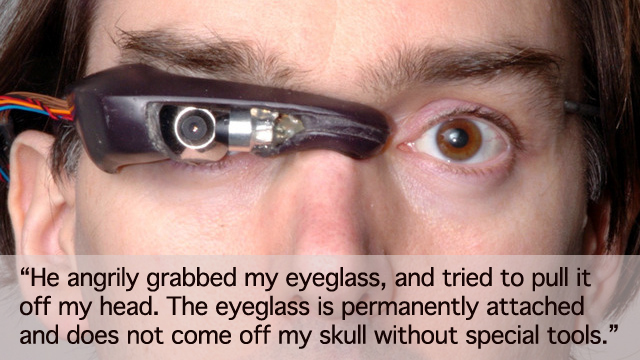 It’s Steve Mann’s, the “father of wearable computing”, eyepiece and it got him beat up in a McDonalds in France. You can read the full story here. Mann was approached by a couple of men who objected to the eyepiece and attempted to forcibly remove it from his head. They also ate his chicken wrap. It was wrong for Mann to be assaulted for any reason, least of all what he chose to wear. Even if there was some concern about surveillance capabilities that doesn’t justify an attack. It was just petty bullying. Mann is using the eyepiece to experience a sort of augmented reality, where information from the internet and other sources is overlayed on his normal vision. This is the same concept, roughly, behind the Google Goggles we saw a few months ago, but there are some details of this that are a little disturbing to me. Mann requires special tools to get the thing off his head. The eye isn’t corrective, its augmentative. And he can take surveillance. This isn’t wearable computing, this is part of his body, and as my childish response might indicate I’m not comfortable with that notion. At the very least I think such inputs are distracting, at worst I think they’re more than our brains are designed to handle. I use corrective lenses to see every day. Some deaf children use Cochlear implants to be able to hear, and there are advances in restoring sight to the blind every year. But that’s not what this is. This is the beginning of trying to merge with machines, to take the information that we get by tapping a few keys, and instead grab it with a few thoughts or by interpreting what we’re looking at. If we continue our Star Trek analogies, Geordi used a visor to see, and yes even though he could take it off there were sensor leads that were always in his head. But again this was to restore a faculty, and even though it gave him some increased abilities, it also came with a set of challenges, headaches for starters. Okay, fictional examples to real world situations but hey I’m a sci-fi futurist. It does come to mind. And okay I know that cameras are probably tracking me a lot of the time anyway, even more so in Europe. But the idea of a street level surveillance operative recording and analyzing everything he sees is creepy. It might not cause me to want to beat him up, but I might ask him to shut it off. Just like I don’t want someone with a cellphone camera capturing my every move, I wouldn’t want someone like Mann to do it either. I’m not saying that’s what he was doing, but clearly from the assault pictures, the thing is set to record under certain circumstances. Hate crimes are not the way to solve anything, but this is an area of tension that we will need to start addressing soon. Not all of us think that wearing our machines is a good idea. I’m a fan of being human, of using the machine I was designed with, and keeping the ones I work with at arm’s length. Mann would disagree with me, and that’s fine. I believe in free society, but every fundamental shift in culture or nature has triggered one form of bigotry or another, and it might be a good idea to keep an eye on this one, augmented or otherwise. To be fair, it was McDonald’s. Noone over the age of 12 is excited by being there and especially not with the prospect of their moment of weakness immortalized by some advanced techno-geek with a biotic eye recording their order for posterity. What was he doing flaunting his tech to the people at McDonald’s anyway? If he has the money for biotic implants, shouldn’t he be be eating at Chez Lois down the street? I guess Borg should stick to their dietary supplements. Mann is being both naive and calculating. Is that possible? Look at all the publicity this has gained for him. I’d never heard of him before reading your article. Quite brilliant. Also I think he chooses not to see how this technology can be used to – stalk women, – advertise children for sale, – capture video images of security systems in banks all in the name of research. And these are the obvious ones. Camera phones are controlled this technology should be too. He was treated abismally in McDonalds but perhaps these employees are illegals and their motivation was fear. Unfortunately I have no sympathy for a man who puts his family through an experience like that for ‘his work’. 1. Is it wrong to augment yourself mechanically, not just to repair something missing but to (try to) improve yourself? 2. Do people who augment themselves have a right to be treated with respect? 3. Is it okay to take covert surveillance of other people? #3 is a violation of privacy, and even if Mann didn’t have that goal in mind, it’s a valid concern for others. Regarding #2, Ben, you hit the nail on the head. Nobody deserves to be abused that way for as little provocation as he gave. Regarding #1, as you know, Ben, we have different views on this. I agree it’s creepy at first glance, but a lot of good things are creepy at first glance. Not saying I would want one myself (or at least not yet), but I don’t have an inherent problem with this kind of modification. @BJ Kerry: Do you have any evidence to back up your claim that Mann was being “calculating”? He was assaulted in a McDonald’s. Even if that has some positive side effects (like publicity), that’s a long way from proving he *wanted* to be assaulted. I can think of far less painful ways to get publicity, and I suspect he can too. @paulaacton: If his wife had to wonder where the images would end up, that’s not a technology problem. That’s a lack of trust.